Description: It is a perennial herb taking an upright, branching form generally growing up through shrubs. 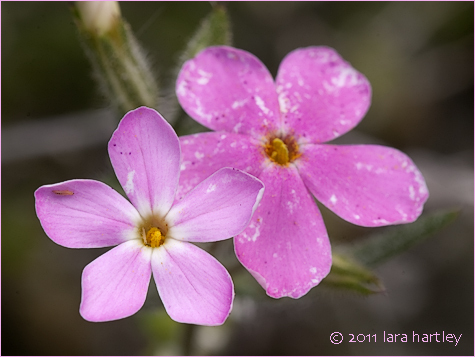 The inflorescence bears one or more white to pink flowers with narrow, tubular throats which may exceed 3 centimeters in length. The base of the tube is encased in a calyx of keeled, ribbed sepals. The flower corolla is flat and five-lobed. Leaf: The hairy linear or lance-shaped leaves are 1-3 cm in length and oppositely arranged. Notes: This photo was taken on May 5, 2004 Mid Hills Campground, Mojave National Preserve, San Bernardino County, California. 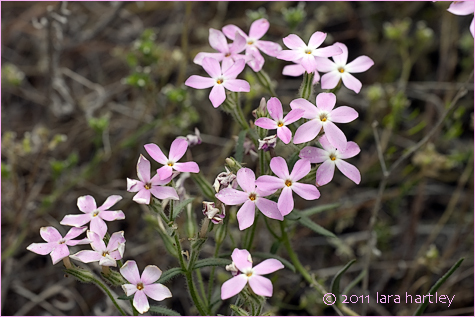 Phlox stansburyi, a dicot, is a perennial herb that is native to California and is also found outside of California, but is confined to western North America.